Gandhi’s name was raised in 1924, 1937, 1938, 1939, 1947 and 1948 in around 100 nominations. Many a genius missed the Nobel Prize. Leo Tolstoy in literature, Lise Meitner, Satyendranath Bose and Meghnad Saha in the sciences; even Einstein was awarded one for the photoelectric effect, not for his revolutionary ‘Theory of Relativity’. Why then is there such lament on Gandhi missing the Nobel Peace Prize? A book of 171 pages titled ‘Gandhi And The Nobel Peace Prize’ written by the noted author Dr. Rajinder Singh of the University of Oldenburg, Germany provides for the first time an authentic and comprehensive account of the ‘why’ and ‘how’ of this case, based largely on his research at the Nobel Peace Prize Institute, Oslo. The book explains the process of filing nominations, short-listing of candidates based on expert advice and how the final decision is taken. Once the basic rules are explained, Singh goes into chronological details of what happened every time Gandhi’s name came up for the prize. Were the nominations sent in time? Was the expert opinion not favourable? Who were the competitors? When was he short listed? All these issues have been discussed threadbare with supporting evidence. At the end of the book, which is rather non-judgemental, the reader appreciates the complexity of the process and the bureaucratic diligence with which assessments were made and comes to terms with the final decision, with a tinge of sadness. The fact that a large number of persons – present and past members of the Nobel Committee, advisers at the Nobel Institute, members of national assemblies and governments and International Court of Justice, holders of Nobel Peace Prize and even university professors of law, political science, history and philosophy – can nominate helps one understands why till 1964 fourteen Indians from Gandhi, Sri Aurobindo, Nehru, Aga Khan III and Radhakrishnan to insignificant ones like Hari Mohan Banerjee could be nominated. Gandhi’s name was raised in 1924, 1937, 1938, 1939, 1947 and 1948 in around 100 nominations. No wonder that Geir Lundestad, permanent secretary of the Norwegian Nobel Committee, admitted “Our record is far from perfect and not giving Mahatma Gandhi the Nobel Prize was the biggest omission”. Gandhi was first nominated in 1924. But the nomination, from the Council of State, Delhi, missed the deadline of 31 January 1924. In 1937, Ole Colbjørnsen, a Norwegian journalist, economist and politician, on behalf of ‘Friends of India’, nominated Gandhi. The ideals of ahimsa that marked his struggle against colonialism as also the fact that Rabindranath Tagore had proclaimed him ‘Mahatma’ were highlighted. Gandhi was again nominated in 1938 by Colbjørnsen, supported by 27 members from the ‘Friends of India’, Denmark. C.F. Andrews wrote, “There is no one in the world who deserves more to receive the Nobel Prize than Mahatma Gandhi. I have known him for twenty-three years and have seen his work of non-violence which has again and again brought peace in the midst of strife…” Gandhi’s Christian followers saw him as a ‘holy Christian’. Even Romain Rolland supported the nomination. Despite such support, Gandhi’s name was not short-listed. Colbjørnsen again wrote, in 1939, reiterating the earlier arguments and adding that ‘the relaxed political situation in the provincial governments is due to Gandhi’s influence.’ This also did not work. By January 1947, three proposals favouring Gandhi were sent by B.G. Kher, G.V. Mavalankar and G.B. Pant. Rajagopalachari also played a role. Finally, Gandhi was shortlisted amongst six. The Nobel Committee asked historian Jens A. Seip to prepare a new report which Seip did by complementing the old one with Gandhi’s contributions since 1937. This period was crucial, both for his achievements and failures. Seip analysed this period through three conflicts – one between Indians and Britons on the autonomy of India, on the question of India’s participation in WW II and the inner conflict between Hindus and Muslims. Extensive analysis followed. Eventually, Gandhi’s role as a leader of violence- free resistance and as a pacifist was appreciated. However, in the Nobel Committee, two members in Gandhi’s favour could not convince the other three. In the midst of the India-Pakistan conflict, a reported statement by Gandhi that if there was no other way to secure justice from Pakistan, the Indian government would be forced to go to war (The Times, September 27, 1947) was also perhaps taken into consideration. Gandhi was finally nominated for the prize in 1948 from different countries like the USA, UK, France, Norway and India, with more than 20 from USA alone. Suddenly, it appeared that the whole world was pleading for Gandhi, almost in unison. Seip again added Gandhi’s contribution between the period of August 15, 1947 to Gandhi’s assassination (30 January 1948). The Nobel Committee, according to Singh, was considering a posthumous prize. But the issue was to find an appropriate successor to receive the prize money. The Nobel Committee was told that Gandhi left no estate and no testament and that The Harijan Trust, Sarvodaya Samaj and The Gandhi Memorial Fund took responsibility to work in his spirit and name. This long process from 1924 to 1948 when Gandhi’s name came up again and again was also the most tumultuous period of our freedom movement. Globally also, it was a turbulent time. Emotional appeals likening Gandhi with Buddha or Christ did not help. Various forces working at the national and international levels might have made it difficult for the Nobel authorities to make an objective assessment of Gandhi at that time. Though gentle, his methods were so radical and original that they created different strands of opinion even in India and were adopted in many parts of the world mostly after his demise. No man in modern history has been more revered and at the same time more misunderstood. That Gandhi was much greater than his mission could be appreciated only by a few. While we, the commoner, fretted at the denial of this recognition to Gandhi, he himself was far above the controversies. 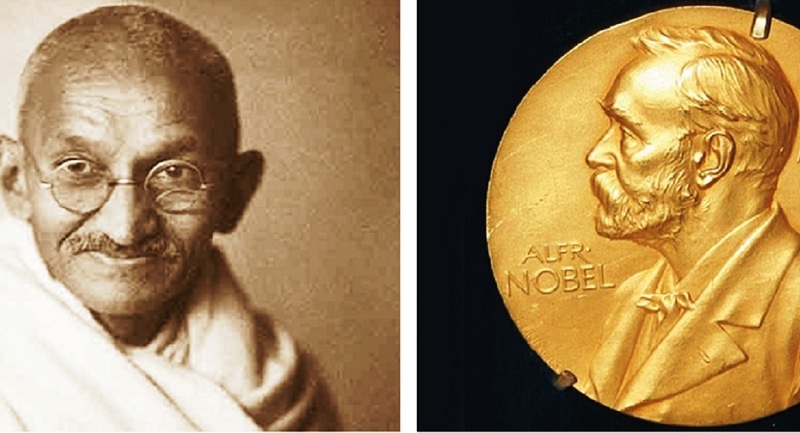 In fact, by failing to honour Gandhi, it is the Nobel Peace Prize that appears small in retrospect.